This month we continue to celebrate World Autism Month with a feature on one of our newest riders. Subira is a ray of sunshine in our barn. She is always so happy and her laughter and can-do attitude are infectious! She had her first introduction to riding at a young age. She participated in an equine therapy program called Path2Learning because she has Autism. The day she trotted on a horse was when she was 4 years old was described by her as “the best part of her day” despite having been to a birthday party, her favorite music class and brunch at Cora’s that same day. She was in love with her horse-time even then. In September, 2018, Subira started riding at Lancers in the Junior Beginner course along with other 8 year olds. She had been waiting to join since her sister Aminata started riding here four years ago. While on the waitlist and waiting to become old enough to join, Subira made sure to come to the pony rides during our Open House and would always come and watch her sister ride. Subira will even come to the barn on Sundays to say hi to her sister when Aminata is working a stablehand shift. Upon completing the Junior Beginner course, Subira has now entered into ride 10. Subira’s love of coming to the barn to see Aminata hasn’t changed and she often always ask to come watch her sister ride so they get chicken nuggets and sit in the viewing room. 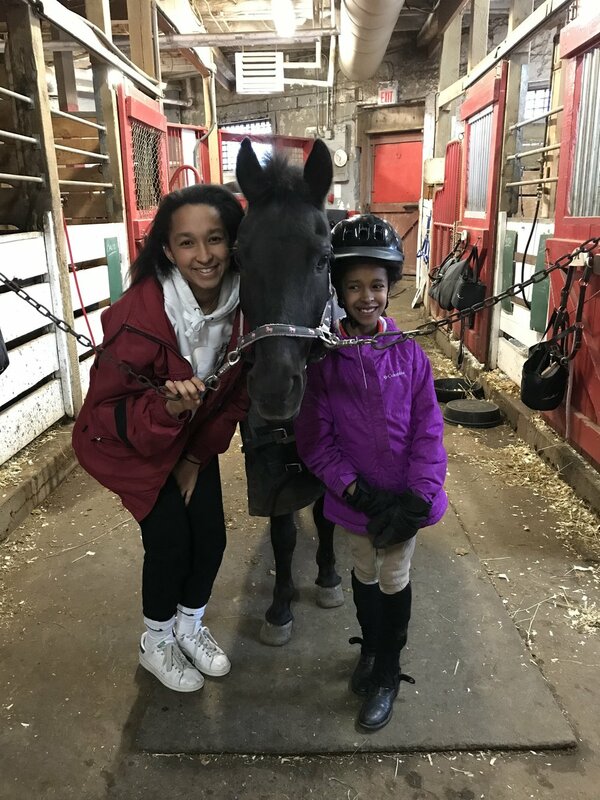 Equally, Aminata will often come down to the barn on Saturday (when instead she could be sitting at home watching Netflix) to watch Subira ride and help out! Although at Lancers we have a Therapeutic Riding Program, Subira joined our junior membership stream. Subira’s mum noted that Autism is a spectrum and everyone who has it is different so not everyone with Autism can join the regular program. For Subira, the having access to lots of different therapies really has really helped her. For instance, when she was young, she entered into an inclusive movement dance program and had one-on-one support. Now, Subira is independently able to be with peers and does not require extra help. Similarly, Subira, according to her mum, needed to start in an Equine Therapy Program and with that experience she was able to join the regular rides and does not need extra help. Her mum added that “there is always the fear, as a parent, that they will not be considered safe or able to be safe somewhere and therefore not permitted to join in”. She continued, “it is an invisible disability”. One of the (many) reasons Subira’s mum likes Lancers is because her daughter is treated just the same as all the other riders. Just like her ride mates, when she needs help bridling or tacking she gets it, and is fully completes her chores, tasks, and responsibilities alongside her peers. When asked what she liked about riding, Subira, with a big smile on her face, exclaimed “Everything! The horses, and cantering! And trotting!” Answering who her favourite horse is was a trickier question. Punkin was a favourite and Subira rode her throughout the Junior Course but she noted that “Punkin is now retired”. Subira now often rides Jake or Ben. Subira seems to have a really special relationship with the horses she rides. Horses are sincere and mean what they say and Subira is the same. She is clear in her communication and positive and it seems that the horses like that. Subira went through extensive therapy in her younger years and does still get therapy to understand social cues with her peers as for someone with Austism, understanding people is tricky, but horses are much easier to understand than human emotions. Horseback riding influenced her life so much already. Subira excels because it is working with an animal where there are facts that she can learn and rules she can work with. Like many parents of our junior riders, Subira’s mum remarked that riding has given Subira so much confidence and she enjoys seeing how both her daughters are becoming little experts and like to correct her when she gets something wrong or find it funny that she can’t do a quick release knot! Subira’s mum also pointed out that Subira has ADHD and isn’t normally focused but she is incredibly focused when she is getting her horse ready and even when tired, gets ready and knows what needs to be done for her ride. Subira is taking full advantage of all the great extra-curriculars at Lancers. She recently participated in our Travis Smith Groundwork Clinic, has entered our upcoming Jump Into Spring Training Show and has just passed her Rider Level 1, which involved a written test, a stable management test and a riding test! Of the testing, Subira said “it was lots of fun and the best part was actually passing”. Subira is definitely not letting any labels stand in her way! In fact, rather than being seen as someone who needs special help, she insists that she wants to be seen as someone who has brown curly hair, big eyes, and Autism. She knows other kids with Autism but she says that they are all different because her Autism is hers!